Chronic cerebral hypoperfusion (CCH) presents persistent reduction in cerebral blood flow (CBF) and mild cognitive impairment [1,2], and is associated with cognitive decline in aging, Alzheimer’s disease (AD) and vascular dementia (VaD), so the pathological processes of CCH have been focused to explore the underlying mechanisms in these diseases [3-5]. Permanent bilateral common carotid artery occlusion (BCCAO), also called 2-VO, produces a chronic, global hypoperfusion state and is less severe than 4-VO (both common carotid arteries and both vertebral arteries occlusion) . BCCAO is so far a common paradigm of experimental models of VaD and AD [2,6,7], and can induce diffuse white matter lesions, hippocampal neuronal cell loss, micro-infarcts and micro-hemorrhages, as well as obvious cognitive impairments such as spatial learning and memory deficits [1,6]. Generally, hippocampus is responsible of spatial learning and memory processes, specifically, neuronal damage caused by BCCAO in the hippocampus is restricted to CA1 subarea [8,9], and some studies further discovered that performance of spatial learning shows a significant correlation with the numbers of neurons in the CA1 area [10,11]. Taken together, the neuronal damage in hippocampal CA1 subarea of BCCAO rats is closely related to the spatial learning and memory impairments. Numerous studies have found that gamma amino butyric acid (GABA)ergic interneurons in hippocampus play an essential role in the regulation of cognitive ability, and marked GABAergic cell loss and decreased GABA neurotransmission in the hippocampal subareas result in cognitive deficits in AD and VaD [9,12-15]. However, the alteration of GABAergic interneurons in the hippocampus has not been clearly identified in CCH so far, even though other pathological changes including neuronal damage, glial activation and oxidative stress have been already reported [6,10,16]. Parvalbumin (PV, a calcium-binding protein)-, neuropeptide Y (NPY, a neuropeptide)- and somatostatin (SOM, another neuropeptide)-positive cells are three well-known subclasses of GABAergic interneurons [17,18] and tend to have an essential role in the modulation of cognitive ability [19-22]. PV-positive interneurons in CA1 of hippocampus are required for spatial working . Several studies have found that GABABRs and HCN2 locate in PV-positive cells in the rat brain, and the regulation of them has positive outcomes in BCCAO rats [23,24]. NPY and its receptors also take a part in the modulation of neuronal functions such as learning and memory , and NPY-pretreatment was found to be beneficial in preventing impairments in spatial memory in AD models . SOM in the brain inhibits the excitatory synaptic transmission, and plays a crucial role in memory and cognition [17,21]. Therefore, the GABAergic interneurons including PV-, NPY- and SOM-positive cells, may take an essential role in the development of CCH-induced cognitive impairments. Here, we studied the altered amounts of GABAergic cells in hippocampal CA1 subarea using immunofluorescence and western blotting, and performed correlation analysis to investigate their causal relationship with cognitive deficits induced by CCH. Fifty-five male Sprague-Dawley rats (230-250 g) were purchased from the Experimental Animal Center of the Fourth Military Medical University and randomly divided into sham group (n=22) and BCCAO group (n=33). Rats were housed in groups under controlled conditions (12- hour light/dark cycle; 22–24°C). Food and water were provided ad libitum throughout the experiment. All experiments followed the guidelines for the Care and Use of Laboratory Animals of the National Institute of Health. Chronic cerebral hypoperfusion was induced with permanent bilateral common carotid artery occlusion (BCCAO). Rats were anesthetized with 10 % chloral hydrate (300 mg/kg, i.p.). The bilateral common carotid arteries and vagal nerves were gently exposed and separated. Each artery was permanently ligated with silk suture. And the wound caused by midline ventral incision was carefully sutured and closed. Remained 22 rats that underwent a sham operation were treated similarly, but the common carotid arteries were not ligated. After the operation, rats were allowed to recover from anesthesia before being returned to their cages. The Morris Water Maze test was carried out twenty-eight days after the surgery for 5 consecutive days, followed by immunohistochemical staining and western blotting. Rats (sham group: n=6; BCCAO group: n=8) underwent MWM tests 28 days after model establishment. The circular tank (divided into four quadrants) was 170cm in diameter and the black platform (1cm below the water surface) was located in the center of quadrant IV. The experiment consisted of a four-day hidden platform test and a one-day single probe test. The procedure was described as previous report . Briefly, the rats were released to the water from a randomized quadrant after training to search for the hidden platform. The time limit to locate the platform was 60 s (interval time was 10 s). The escape latency was recorded. Then we removed the platform in the pool on Day32 and performed the probe trial. The rats swam in the pool for a fixed time (60 s) and the percentage of time spent in the target, the number of platform crossings and the swimming speed were recorded. Rats (sham group: n=6; BCCAO group: n=8) were sacrificed to observe the altered GABAergic cells on Day33 after MWM test. Rats were anesthetized using 300 mg/kg chloral hydrate and perfused with 0.9% phosphate-buffered saline (PBS, pH 7.3) followed by 4% paraformaldehyde. The brains were removed and immersed in 4% paraformaldehyde overnight. Brain samples were routinely dehydrated, embedded in paraffin, and cut into several sections (bregma from -2.64 mm to -3.48 mm). These sections were immersed in 0.3% H2O2 at room temperature for 30min followed by 0.15% Triton for 5 min and then 3% albumin from donkey serum for 30 min. The sections were incubated overnight with rabbit anti-NeuN antibody (1:200; ab177487; Abcam) or mouse anti-NeuN antibody (1:100, MAB377, Millipore), rabbit anti-Parvalbumin antibody (1:500; ab11427; Abcam), rabbit anti-Somatostatin antibody (1:200; ab183855; Abcam) and rabbit anti-Neuropeptide Y antibody (1:200; ab30914, Abcam). Then, sections for NeuN-immunohistochemical staining were processed with horseradish peroxidase (HRP)-conjugated IgG, streptavidin-biotin complex (SABC) and3.3’-diaminobenzidine tetrahydrochloride (DAB) (Dako EnVision Dual Link System HRP, Dako) and observed by light microscope. The rest of the sections were detected using secondary antibodies (goat antirabbit Alexa Fluor 488-conjugaged and goat antimouse Alexa Fluor 594-conjugaged) (1:1000, Invitrogen) at room temperature for 3h, followed by 0.0001% 4’,6-diamidino-2-phenylindole (DAPI, Sigma) staining for 10min. Images were acquired using a confocal laser scanning microscope (FV1000, JPN). The number of NeuN, parvalbumin (PV), neuropeptide Y (NPY) and somatostatin (SOM)-positive cells was counted by Image pro 6.0 (magnification, 200×) in hippocampal CA1 subarea (including stratum oriens (SO), pyramidale (SP) and radiatum (SR)) which was delineated for each section according to Paxinos and Watson . Data obtained from the multiple sections (at least 10 sections) by 3 investigators were averaged to obtain a single estimate for each animal and then used for quantification. Cell proteins were extracted on Day33 from the hippocampal CA1 area of rats (sham group: n=6; BCCAO group, n=8) for immunoblotting analysis using the BioRad protein assay kit (Hercules, DE, USA) and measured using micro-BCA protein assay (Pierce, UT, USA). Protein samples were fractionated with 10 % SDS-PAGE gel, transferred to 0.45-lm PVDF membranes, and stained with Ponceau red to confirm equal loading. The blots were blocked with 5 % non-fat milk at room temperature for 1 h. Membranes were then incubated with primary antibodies, rabbit anti-PV (1:2000), rabbit anti-SOM (1:1000), rabbit anti-NPY (1:1000) and rabbit anti-β-actin (1:2000) (ab8227, Abcam) in TBST at 4 ℃ overnight, washed three times with TBST, and incubated with peroxidase- conjugated secondary antibodies (anti-rabbit, 1:3000, Santa Cruz) for 30 min. Membranes were washed three times with TBST, and labeled proteins were visualized with chemiluminescence (SuperSignal West Pico, Pierce). Semiquantification of the electrophoresis bands on X-ray film was analyzed using Quantity One 4.6.2 software. Densities were normalized to β-actin. The behavioral and morphological assessments were performed by treatment-blinded investigators. All of the data were expressed as mean ± SEM. Results of MWM test were first statistically analyzed by repeated measures (General Linear Model), and then individual day comparisons were analyzed by Student’s t-test, which was also used to analyze the results from time spent in the target quadrant and the number of target crossings. Correlations between the measures of cognitive function and morphological changes in BCCAO rats were analyzed by Pearson’s correlation coefficients, corrected for multiple comparisons using Bonferroni correction. The data were performed using SPSS 19.0 (SPSS Inc.). P<0.05 was considered statistically significant. 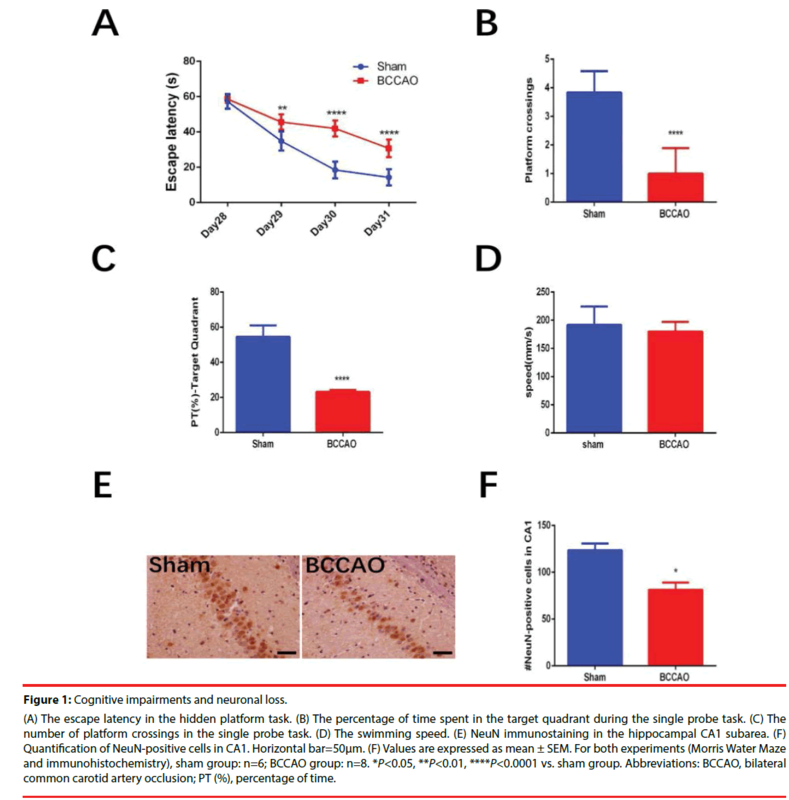 Figure 1 shows the impaired cognitive function and neuronal loss in hippocampal CA1 subarea in rats subjected to BCCAO. Overall, 33 rats underwent the BCCAO surgery and 10 rats died within the first three days after the surgery. The Morris Water Maze test was carried out from Day28 to Day32. The BCCAO group showed significant cognitive impairments compared to the sham group in the hidden platform tasks (**P=0.0077<0.01 for Day29, ****P<0.0001 for Day30, ****P<0.0001 for Day31, Figure 1A) and in the single probe test (****P<0.0001, Figure 1B and ****P<0.0001, (Figure 1c)). While no significant difference was found between the two groups in terms of swimming speed (Figure 1D). Significant neuronal loss in the hippocampal CA1 subarea was found in the BCCAO group (84.14 ± 10.33) compared to the sham group (128.73 ± 17.15) (*P=0.0359<0.05) according to NeuN-immunohistochemical staining (Figure 1B). Figure 1: Cognitive impairments and neuronal loss. (A) The escape latency in the hidden platform task. (B) The percentage of time spent in the target quadrant during the single probe task. (C) The number of platform crossings in the single probe task. (D) The swimming speed. (E) NeuN immunostaining in the hippocampal CA1 subarea. (F) Quantification of NeuN-positive cells in CA1. Horizontal bar=50μm. (F) Values are expressed as mean ± SEM. For both experiments (Morris Water Maze and immunohistochemistry), sham group: n=6; BCCAO group: n=8. *P<0.05, **P<0.01, ****P<0.0001 vs. sham group. Abbreviations: BCCAO, bilateral common carotid artery occlusion; PT (%), percentage of time. Figures 2 and 3 illustrate the significantly decreased GABAergic expression in the hippocampal CA1 subarea in rats subjected to BCCAO. Immunofluorescence experiments were performed on Day33 to estimate the numbers of the GABAergic interneurons (including PV-, NPY- and SOM-positive neurons) of the two groups (Figure 2A-B). 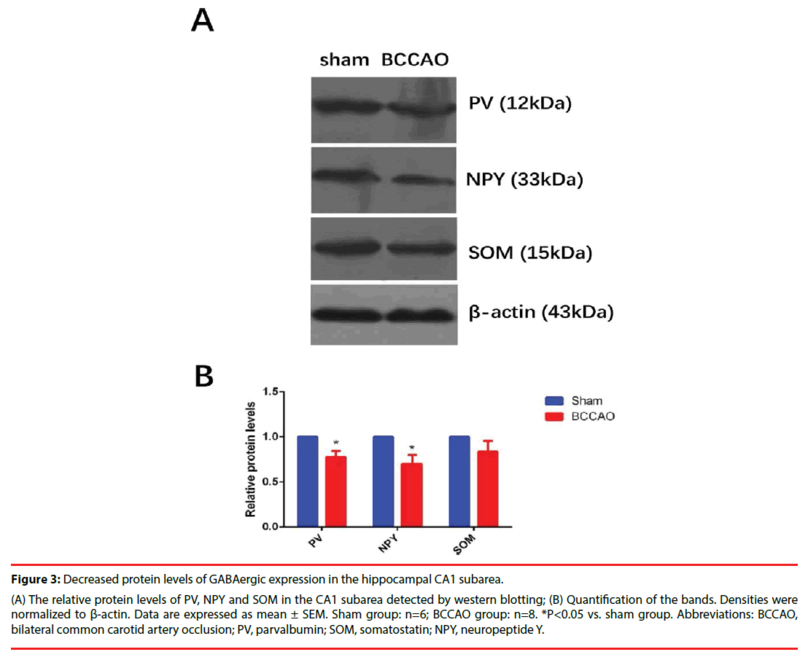 These experiments revealed that the population of PV- and NPYpositive neurons in the CA1 region decreased in the BCCAO group compared to the sham group (*P=0.0233<0.05 for PV; **P=0.0024<0.01 for NPY), but the SOM-positive neurons in the BCCAO group showed no significant difference compared to the sham group (*P=0.4140>0.05). Besides, western blotting results further manifested that the relative protein levels of PV and NPY in the CA1 subarea significantly decreased compared to the sham group (*P=0.0272<0.05 for PV; *P=0.0391<0.05 for NPY), while no significant difference was found in the protein levels of NPY between the sham group and BCCAO group (*P=0.0618 >0.05) (Figure 3A-B). Figure 2: GABAergic neuronal loss in the hippocampal CA1 subarea. (A) Doubled immunostained subclasses of GABAergic interneurons (PV, NPY, SOM) (green) with NeuN (red) and DAPI (blue) in the sham group and the BCCAO group, the horizontal bar=50μm; (B) Quantification of subclasses of GABAergic interneurons in the CA1 subarea,the data are expressed as mean ± SEM. Sham group: n=6; BCCAO group: n=8. *P<0.05, **P<0.01 vs. sham group. Abbreviations: BCCAO, bilateral common carotid artery occlusion; PV, parvalbumin; SOM, somatostatin; NPY, neuropeptide Y. Figure 3: Decreased protein levels of GABAergic expression in the hippocampal CA1 subarea. (A) The relative protein levels of PV, NPY and SOM in the CA1 subarea detected by western blotting; (B) Quantification of the bands. Densities were normalized to β-actin. Data are expressed as mean ± SEM. Sham group: n=6; BCCAO group: n=8. *P<0.05 vs. sham group. Abbreviations: BCCAO, bilateral common carotid artery occlusion; PV, parvalbumin; SOM, somatostatin; NPY, neuropeptide Y. Furthermore, Pearson’s correlation analysis revealed that spatial learning and memory ability directly correlated with the numbers of PV- and NPY-positive cells in the hippocampal CA1 subarea in BCCAO rats (Figure 4A-F). The escape latency on Day31 in the water maze was defined as the performance of spatial learning (24.21 ± 2.69); the time spent in the target quadrant in probe trial was defined as the performance of spatial memory (40.30 ± 4.11), as described before [10,27]. And the calculated numbers of GABAergic cells were: PV, 24.93 ± 1.01; NPY, 23.93 ± 1.14; SOM, 36.14 ± 0.91 (all of the data are expressed as mean ± SEM). The main findings of the correlation analysis were that (1) the performance of spatial learning showed a significant negative correlation with PV-positive neurons (r=-0.6824, **P=0.0072<0.01), and NPY-positive neurons (r=-0.7292, **P=0.0031<0.01) in CA1 subarea, but not SOM-positive cells (r=-0.4358, P>0.05); (2) the performance of spatial memory showed a significant positive correlation with PV-positive cells (r=0.7039, **P=0.0050<0.01), NPYpositive cells (r=0.6887, **P=0.0065<0.01), but not SOM-positive cells (r=0.3942, P>0.05). 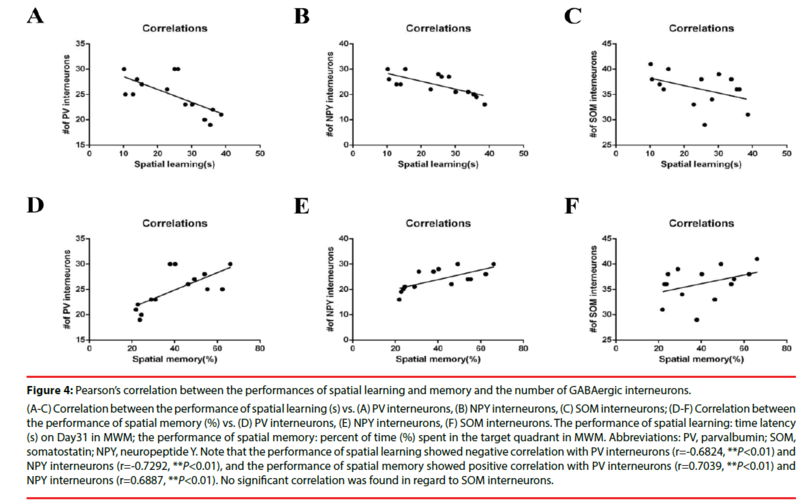 Figure 4: Pearson’s correlation between the performances of spatial learning and memory and the number of GABAergic interneurons. (A-C) Correlation between the performance of spatial learning (s) vs. (A) PV interneurons, (B) NPY interneurons, (C) SOM interneurons; (D-F) Correlation between the performance of spatial memory (%) vs. (D) PV interneurons, (E) NPY interneurons, (F) SOM interneurons. The performance of spatial learning: time latency (s) on Day31 in MWM; the performance of spatial memory: percent of time (%) spent in the target quadrant in MWM. Abbreviations: PV, parvalbumin; SOM, somatostatin; NPY, neuropeptide Y. Note that the performance of spatial learning showed negative correlation with PV interneurons (r=-0.6824, **P<0.01) and NPY interneurons (r=-0.7292, **P<0.01), and the performance of spatial memory showed positive correlation with PV interneurons (r=0.7039, **P<0.01) and NPY interneurons (r=0.6887, **P<0.01). No significant correlation was found in regard to SOM interneurons. Chronic cerebral hypoperfusion (CCH) causes learning and memory deficits and up-regulates the risk of vascular dementia (VaD) and Alzheimer’s disease (AD) through pathological processes such as neuronal damage, glial activation, and oxidative stress, etc. [1,2,6]. Previously, we and others have observed GABAergic dysfunction in animal models of bilateral common carotid artery occlusion (BCCAO), including reduced expression of GAD67 and GABABRs (which may function through restoring HCN1/ HCN2 surface expression) in CA1 region and cerebral cortex, and decreased excitability of CA1 interneurons [12,23,24]. But the altered amounts of subclasses of GABAergic cells, such as parvalbumin (PV)-, neuropeptide Y (NPY)- and somatostatin (SOM)-positive cells, in the hippocampus of BCCAO rats have not been systematically investigated so far. In the present study, we found that (1) BCCAO could induce obvious cognitive deficits and neuronal loss in CA1 subarea; (2) GABAergic cell loss in CA1 caused by BCCAO were PV- and NPYpositive interneurons, but not SOM-positive interneurons; (3) The population of PV- and NPY-positive interneurons in the hippocampal CA1 subarea correlated with spatial learning and memory performances. Permanent BCCAO in rats has been wellestablished model to investigate the effects of CCH on cognitive dysfunction and neurodegenerative processes [6,28,29]. Rat BCCAO is quite close to most clinical VaD in comparison with 4-VO . Some scientists found that impaired learning and memory tested by Morris Water Maze (MWM) appears obviously after Day7, but some hippocampal changes exist within 4 weeks [11,30]. We performed MWM on Day28 after surgery and found obvious cognitive deficits, which is consistent with previous findings [15,23,31]. Apart from MWM test, some studies have reported that the radial arm maze (food serves as a reward, suitable for investigation of spatial working memory and spatial reference memory) and T mazes (cerebral cortex-dependent, suitable for investigation of working memory) can be used to evaluate the cognitive impairments in BCCAO rats as well . BCCAO produces reductions of oxygen and glucose in brain, which may in turn cause neuronal loss . As expected, we observed dramatic NeuN-positive cell (which represents the mature neurons) loss in the CA1 region. 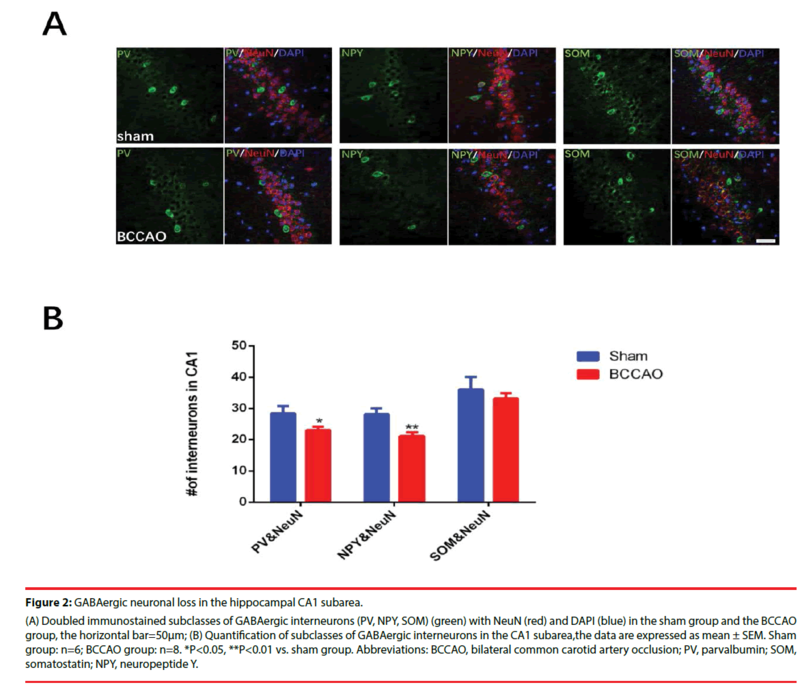 Although differences in the brain vulnerability to ischemia are observed in most strains of BCCAO models, a similar pattern of selective hippocampal CA1 neuronal loss has been found [10,11,32]. The severity of hippocampal neuronal loss in the BCCAO models may be different in terms of animals (such as rat, mouse and gerbil) [9,32], time of occlusion [12,33], etc. Furthermore, significant cell loss of hippocampal GABAergic interneurons has been reported in the neurodegenerative diseases as well, such as AD and aging [34,35]. However, the altered population of specific subclasses of GABAergic cells in the hippocampus remains unclear in CCH. In this study, we found that PV and NPY interneurons, but not SOM interneurons, significantly decreased in CA1 area. As the BCCAO model used here presents chronic and moderate ischemia, the altered amounts of these specific GABAergic cells could be different in comparison to the results in acute ischemia. The numbers of PV- and NPY-positive cells slowly reduced in the hippocampus in acute cerebral ischemia, and SOM-positive cells decreased in transient global ischemia as well, but they tend to be resistant to ischemia when co-localized with PV [36-39]. Meanwhile, Luo et al. recently reported the unchanged amounts of GABAergic cells in the prefrontal cortex during CCH, and suggested that deficits of cognitive ability induced by CCH may also result from the GABAergic interneuron dysfunction (such as alteration of electrophysiological properties). It seems that the alteration of the population of GABAergic cells differs in areas of the rat brain in CCH. We did observe significant GABAergic cell loss in the hippocampal CA1 subarea in CCH. Apart from this, the population of GABA- and GAD67- positive cells in hippocampal CA1 subarea also significantly declines during CCH according to our previous findings . These findings may reflect the selectively impaired GABAergic function in hippocampal CA1 subarea. GABAergic cell loss in the hippocampus has been reported in animal models of AD, VaD, aging and epilepsy, all of which present cognitive impairments at different levels according to the previous research [9,22,25,35,40]. These findings indicate that there may be a causal relationship between these two factors. In terms of CCH, numerous studies indicated that the overall neuronal loss in CA1 region is associated with cognitive impairments (tested by MWM and T-maze), and even the death rate of rats subjected to BCCAO surgery [10,41]. But it is still unknown whether the population of specific subclasses of GABAergic cells correlates with cognitive performance in CCH or not. Here we found that the amount of two subclasses of GABAergic interneurons (PV and NPY) significantly correlated with cognitive performance in BCCAO rats, which indicated that these two subclasses of GABAergic interneurons take a part in the pathogenesis of cognitive deficits induced by CCH. However, it remains controversial about the results of significant correlations between cognitive deficits and GABAergic cell loss in the brain over the years. Miettinen et al. reported that the PV-containing neurons (in the cortex) correlates with performance deficits in spatial learning in aged rats and Dournaud et al. demonstrated that SOM-containing elements (in the frontal and temporal lobes) are relevant to cognitive decline in AD patients. On the other hand, Alom et al. evaluated the cerebrospinal fluid NPY (measured by radioimmunoassay) in 20 patients with AD and did not found significant correlation between NPY and degree of cognitive impairments in these patients. It seems that the accurate correlation analysis between these two factors depends on stable experimental conditions and large number of samples. In the present study, we finally observed significant correlations between cognitive ability and PV- and NPY-positive cells. Taken together, our results suggested that the PV- and NPY-positive cell loss in hippocampal CA1 subarea is involved in the development of cognitive impairments in a rat model of CCH. The authors confirm that there are no conflicts of interests. Weiping Liu is responsible for the final version. This work was supported by the Project of Science and Technology Research of Xi’an (No. 2017115SF/YX009). Soria G, Tudela R, Márquez-Martín A, et al. The Ins and Outs of the BCCAo Model for Chronic Hypoperfusion: A Multimodal and Longitudinal MRI Approach. PLoS. ONE 8(9), e74631 (2013). Jiwa NS, Garrard P, Hainsworth AH. Experimental models of vascular dementia and vascular cognitive impairment: a systematic review. J. of. Neurochem 115(4), 814-828 (2010). Kwon KJ, Kim MK, Lee EJ, et al. Effects of donepezil, an acetylcholinesterase inhibitor, on neurogenesis in a rat model of vascular dementia. J. Neurol. Sci 347(1-2), 66-77 (2014). Sun LH, Ban T, Liu CD, et al. Activation of Cdk5/p25 and tau phosphorylation following chronic brain hypoperfusion in rats involves microRNA-195 down-regulation. J. Neurochem 134(6),1139-1151 (2015). Shakil H, Saleem S. Genetic Deletion of Prostacyclin IP Receptor Exacerbates Transient Global Cerebral Ischemia in Aging Mice. Brain. Sci 3(3),1095-1108 (2013). Farkas E, Luiten PG, Bari F. Permanent, bilateral common carotid artery occlusion in the rat: a model for chronic cerebral hypoperfusion-related neurodegenerative diseases. Brain. Res. Rev 54(1),162-180 (2007). Farkas E, Luiten PGM, Bari F. Permanent, bilateral common carotid artery occlusion in the rat: A model for chronic cerebral hypoperfusion-related neurodegenerative diseases. Brain. Research. Reviews 54(1),162-180 (2007). Bennett SA, Tenniswood M, Chen JH, et al. Chronic cerebral hypoperfusion elicits neuronal apoptosis and behavioral impairment. Neuroreport 9(1),161-166 (1998). Long Q, Hei Y, Luo Q, et al. BMSCs transplantation improves cognitive impairment via up-regulation of hippocampal GABAergic system in a rat model of chronic cerebral hypoperfusion. Neuroscience 311(1), 464-473 (2015). Xi Y, Wang M, Zhang W, et al. Neuronal damage, central cholinergic dysfunction and oxidative damage correlate with cognitive deficits in rats with chronic cerebral hypoperfusion. Neurobio. Of. Lear. And. Memory 109(1), 7-19 (2014). Bennett SA, Tenniswood M, Chen JH, et al. Chronic cerebral hypoperfusion elicits neuronal apoptosis and behavioral impairment. Neuroreport 9(1), 161-166 (1998). Zhan RZ, Nadler JV, Schwartz-Bloom RD. Impaired firing and sodium channel function in CA1 hippocampal interneurons after transient cerebral ischemia. J. Cereb. Blood. Flow. Metab. 27(8), 1444-1452 (2007). Limon A, Reyes-Ruiz JM, Miledi R. Loss of functional GABAA receptors in the Alzheimer diseased brain. Procee. Of. The. National. Academy. Of. Sciences 109(25), 10071-10076 (2012). Loreth D, Ozmen L, Revel FG, et al. Selective degeneration of septal and hippocampal GABAergic neurons in a mouse model of amyloidosis and tauopathy. Neurobiology. Of. Disease 47(1),1-12 (2012). Lu Y, Li C, Zhou M, et al. Clonidine ameliorates cognitive impairment induced by chronic cerebral hypoperfusion via up-regulation of the GABAR1 and GAD67 in hippocampal CA1 in rats. Pharmacol. Biochem. Behav 132(1), 96-102 (2015). Sakr HF, Khalil KI, Hussein AM, et al. Effect of dehydroepiandrosterone (DHEA) on memory and brain derived neurotrophic factor (BDNF) in a rat model of vascular dementia. J. Physiol. Pharmacol 65(1), 41-53 (2014). Borbély É, Scheich B, Helyes Z. Neuropeptides in learning and memory. Neuropeptides 47(6), 439-450 (2013). Long Q, Upadhya D, Hattiangady B, et al. Intranasal MSC-derived A1-exosomes ease inflammation, and prevent abnormal neurogenesis and memory dysfunction after status epilepticus. Proceedings. Of. the. National. Academy. Of. Sciences 114(17), E3536-E3545 (2017). Murray AJ, Sauer JF, Riedel G, et al. Parvalbumin-positive CA1 interneurons are required for spatial working but not for reference memory. Nat. Neurosci 14(3), 297-299 (2011). Sawano E, Iwatani K, Tominaga-Yoshino K, et al. Reduction in NPY-positive neurons and dysregulation of excitability in young senescence-accelerated mouse prone 8 (SAMP8) hippocampus precede the onset of cognitive impairment. J. Neurochem 135(2), 287-300 (2015). Tuboly G, Vecsei L. Somatostatin and cognitive function in neurodegenerative disorders. Mini. Rev. Med. Chem 13(1), 34-46 (2013). Marks WD, Paris JJ, Schier CJ, et al. HIV-1Tat causes cognitive deficits and selective loss of parvalbumin, somatostatin, and neuronal nitric oxide synthase expressing hippocampal CA1 interneuron subpopulations. J. Neurovirol 22(6),747-762 (2016). Luo P, Chen C, Lu Y, et al. Baclofen ameliorates spatial working memory impairments induced by chronic cerebral hypoperfusion via up-regulation of HCN2 expression in the PFC in rats. Behavioural. Brain. Research 308(1), 6-13 (2016). Vollenweider F, Bendfeldt K, Maetzler W, et al. GABAB receptor expression and cellular localization in gerbil hippocampus after transient global ischemia. Neuroscience. Letters 395(2), 118-123 (2006). Spencer B, Potkar R, Metcalf J, et al. Systemic Central Nervous System (CNS)-targeted Delivery of Neuropeptide Y (NPY) Reduces Neurodegeneration and Increases Neural Precursor Cell Proliferation in a Mouse Model of Alzheimer Disease. J. Biol. Chem 291(4), 1905-1920 (2016). Paxinos G, Watson C. The Rat Brain in Sterotaxic Coordinates. 5th ed.[M]. Academic Press., 2005. Zhang W, Hao J, Liu R, et al. Soluble Abeta levels correlate with cognitive deficits in the 12-month-old APPswe/PS1dE9 mouse model of Alzheimer's disease. Behav. Brain. Res 222(2), 342-350 (2011). Akinyemi RO, Mukaetova-Ladinska EB, Attems J, et al. Vascular risk factors and neurodegeneration in ageing related dementias: Alzheimer's disease and vascular dementia. Curr. Alzheimer. Res 10(6), 642-653 (2013). Yang Y, Zhang J, Liu H, et al. Changes in Levels of Hypoxia-Induced Mediators in Rat Hippocampus During Chronic Cerebral Hypoperfusion. Neurochemical. Research 38(11), 2433-2439 (2013). Vicente E, Degerone D, Bohn L, et al. Astroglial and cognitive effects of chronic cerebral hypoperfusion in the rat. Brain. Res 1251(1), 204-212 (2009). Tian XS, Guo XJ, Ruan Z, et al. Long-Term Vision and Non-Vision Dominant Behavioral Deficits in the 2-VO Rats Are Accompanied by Time and Regional Glial Activation in the White Matter: e101120. 9(6), (2014). Kudo T, Takeda M, Tanimukai S, et al. Neuropathologic changes in the gerbil brain after chronic hypoperfusion. Stroke 24(2), 259-264 (1993). Liang X, Nagai A, Sheikh AM, et al. Increased vulnerability of hippocampal CA1 neurons to hypoperfusion in ataxia and male sterility (AMS) mouse. Brain. Res 1494(1), 109-117 (2013). Li G, Bien-Ly N, Andrews-Zwilling Y, et al. GABAergic Interneuron Dysfunction Impairs Hippocampal Neurogenesis in Adult Apolipoprotein E4 Knockin Mice. Cell. Stem. Cell 5(6), 634-645 (2009). Stanley EM, Fadel JR, Mott DD. Interneuron loss reduces dendritic inhibition and GABA release in hippocampus of aged rats. Neurobiol. Aging 33(2), 431 (2012). Araki T, Kato H, Liu XH, et al. An immunohistochemical study of parvalbumin containing interneurons in the gerbil hippocampus after cerebral ischemia. Metab. Brain. Dis 9(3), 225-234, (1994). Bering R, Diemer NH, Draguhn A, et al. Co-localization of somatostatin mRNA and parvalbumin in the dorsal rat hippocampus after cerebral ischemia. Hippocampus 5(4), 341-348 (1995). Larsson E, Lindvall O, Kokaia Z. Stereological assessment of vulnerability of immunocytochemically identified striatal and hippocampal neurons after global cerebral ischemia in rats. Brain Res 913(2), 117-132 (2001). Johansen FF, O'Hare MM. Loss of somatal neuropeptide y immunoreactivity in the rat hippocampus following transient cerebral ischemia. J. Neurosurg. Anesthesiol 1(4), 339-345, (1989). Soukupová M, Binaschi A, Falcicchia C, et al. Impairment of GABA release in the hippocampus at the time of the first spontaneous seizure in the pilocarpine model of temporal lobe epilepsy. Experimental. Neurology 257(1), 39-49 (2014). Soares LM, Schiavon AP, Milani H, et al. Cognitive impairment and persistent anxiety-related responses following bilateral common carotid artery occlusion in mice. Behavioural. Brain. Research 249(1), 28-37 (2013). Miettinen R, Sirvio J, Riekkinen PS, et al. Neocortical, hippocampal and septal parvalbumin- and somatostatin-containing neurons in young and aged rats: correlation with passive avoidance and water maze performance. Neuroscience 53(2), 367-378 (1993). Dournaud P, Delaere P, Hauw JJ, et al. Differential correlation between neurochemical deficits, neuropathology, and cognitive status in Alzheimer's disease. Neurobiol. Aging 16(5), 817-823, (1995). Alom J, Galard R, Catalan R, et al. Cerebrospinal fluid neuropeptide Y in Alzheimer's disease. Eur Neurol 30(4), 207-210 (1990).